MAY 1, 2018 (WASHINGTON, DC) – RADM Jonathan W. White USN (ret.) 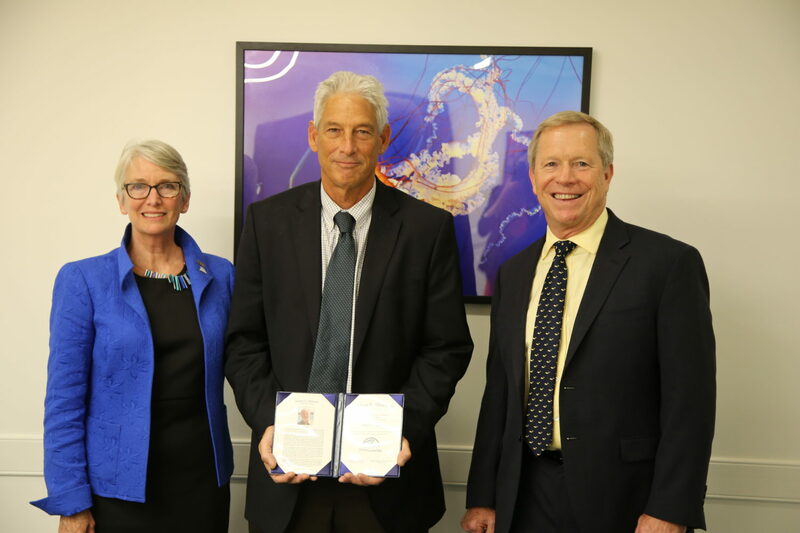 and President and CEO of the Consortium for Ocean Leadership (COL), joins COL Board Chair, Jackie Dixon, Dean of the USF College of Marine Sciences, to present Hank Lobe, President of Severn Marine Technologies, with the Graham Shimmield Leadership Award. “Hank is the inaugural recipient of this award and has worked tirelessly to advance COL’s engagement with ocean industry and to nurture their active inclusion in COL and our activities. We are grateful to him for his inspirational leadership, just as we are eternally grateful to Graham Shimmield for his selfless dedication and leadership in the ocean sciences,” says RADM White.